Claim: Solar activity not a key cause of climate change, study shows | Watts Up With That? From the University of Edinburgh , another one-paper syndrome in the making funded by an NGO research council with a political mission to grab a headline. And, another poorly written press release where they don’t even cite the name of paper. Sigh. I’m not so sure this fellow is fully versed on climatology. His papers up to 2011 were all about cosmology, then all of the sudden he starts publishing on climatology issues. One wonders if his previous funding dried up to make such a dramatic shift in study. Then there is: “…climatic fingerprints of high and low solar forcing derived from model simulations…”. IPCC Models haven’t been able to reproduce the last ten years; what makes them think they are worth anything 100-200 years ago? The climate of the past millennium was marked by substantial decadal and centennial scale variability in the Northern Hemisphere1. Low solar activity has been linked to cooling during the Little Ice Age (AD 1450–1850; ref. 1) and there may have been solar forcing of regional warmth during the Medieval Climate Anomaly2, 3, 4, 5 (AD 950–1250; ref. 1). The amplitude of the associated changes is, however, poorly constrained5, 6, with estimates of solar forcing spanning almost an order of magnitude7, 8, 9. Numerical simulations tentatively indicate that a small amplitude best agrees with available temperature reconstructions10, 11, 12, 13. Here we compare the climatic fingerprints of high and low solar forcing derived from model simulations with an ensemble of surface air temperature reconstructions14 for the past millennium. Our methodology15 also accounts for internal climate variability and other external drivers such as volcanic eruptions, as well as uncertainties in the proxy reconstructions and model output. We find that neither a high magnitude of solar forcing nor a strong climate effect of that forcing agree with the temperature reconstructions. We instead conclude that solar forcing probably had a minor effect on Northern Hemisphere climate over the past 1,000 years, while, volcanic eruptions and changes in greenhouse gas concentrations seem to be the most important influence over this period. Figure 1: Simulations and temperature reconstructions. a, Simulations with all forcings (red and green) compared with a reconstruction ensemble14 (blue), and instrumental HadCRUT4 (ref. 24) time series (centred on the average reconstruction over time of overlap, black). My research is linked below. My research is quite contrary to the article. I’m not so sure this fellow is fully versed on climatology.? hmm. are you talking about Ross mcKittrick? Steve McIntyre? Check the other authors. The third is rather well known. I’ll take actual temp measurements along with solar activity observations over “computer-based models of past climate”. I note that these guys have a forcing impact for today’s CO2 levels of 1.5Wm2, which is just a little less than the change in the Sun’s measured irradiation over its 11 year cycle. Then, they define “climate change” in such a way that it only includes changes which can be attributed to the cause that they have already chosen. Then they write up a study, and claim that this study “Proves” that they have invalidated all other sources of “climate change”, in favor of their pre-selected “cause”. brilliant, I suppose, but only for those who are impressed by academic gamesmanship. You note that his previous work was on cosmology. I humbly suggest that Dr Andrew Schurer’s time would be put to far more productive us in the future if he focused on cosmetology; at least he might have a chance of turning out something productive. A wop bop a loom op a lop bam boom? Sun not involved in climate new NGO funded study says. Everyone should try and read Paul Pierett’s paper above. I was about to have a look at this paper below, guess no need to now. A paper published in Earth and Planetary Science Letters finds solar activity was strongly correlated to climate change over the past 200,000 years. The paper reconstructs solar geomagnetic field strength using the 10Be isotope proxy of cosmic rays, which is inversely related to solar activity. The reconstruction in Figure 2 shows solar activity at the end of the record [“near present day”] was at some of the highest levels of the past 200,000 years, and solar geomagnetic field intensity approximately 3 times higher than during the ice age ~180,000 years ago. Stephen Mosher says “Check the other authors. The third is rather well known.” Indeed, she is a well known alarmist. See climategate. Which basically means they picked some models that did what they wanted ran some simulations, and then regressed the heck out of it until they got what they wanted. Later in the paper they discuss how they did different analyses on different subsets of the “data” (i.e. different time periods of reconstructions based on the data) to extract various pieces of information. The paper will provide an excellent example for undergraduate science courses in the dangers of too readily available regression packages and the need to make minimal assumptions when doing statistical analysis. 1. They use a conventional climate model which does not consider any of the many solar amplification mechanisms described in the literature. 2. They switch datasets used for solar forcing from Steinhilber et al to Wang et al in the year 1800. If they had maintained consistency and used Steinhilber all the way through the year 2000, there would have been greater solar forcing at the end of the 20th century. 3. They don’t consider accumulated solar energy/time integral of solar activity, which can explain 95% of climate change over the past 400 years. Suggest you still have a look – the paper makes a strong case that glacial-interglacial cycles are primarily due to changes in solar activity, not Milankovitch Cycles, which suffer from the so-called 100,000 year problem. I think I am pressing that large red button. No, not the one that says EASY. >> I’m not so sure this fellow is fully versed on climatology.? > hmm. are you talking about Ross mcKittrick? Steve McIntyre? I don’t see them listed as contributors. > Check the other authors. The third is rather well known. He is a postdoc (which is what Research Associate usually means at that stage of his work); the work before (08) must be grad work, but I couldn’t figure out who his mentor was just from the author lists. It is common and often recommended to slightly switch focus and institution between you grad work and your post doc work. All postdocs are scientists for hire. Or you don’t eat. 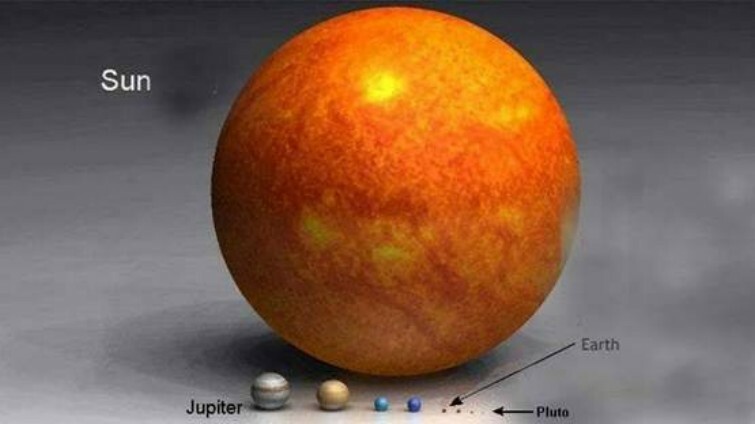 And BTW re cosmology, the sun is a star. Sorry to see this came out of Edinburgh, not noted for being a hotbed of lunacy under normal circumstances. As you say Schurer is not exactly noted as a climatologist. Hegerle is and it would be interesting to know why she has linked up with Schurer. Tett is Chair of Earth System Dynamics and Modelling and Head of the Global Change Research Institute as well as being ex-Hadley Centre, so we know where he’s coming from. Maybe Schurer is the fall guy just as (I still claim!) Mann was for MBH98. I guess, based on this study, we have nothing to fear when our sun goes super-nova. NERC or NDRC? Which funded the study? As far as I can see the model does not include interactive ozone (i.e. ozone will vary with temperature, atmospheric dynamics and chemistry). Funny enough, although the SI has a section on ozone, the section actually does not say a single thing about ozone. In all honesty, if your model does not have interactive ozone and thus no coupling between changes in ozone and dynamics, I would have a hard time buying that you can say much about the influence of solar variability. Most climate models don’t have interactive ozone, in particular those use for the Paleoclimate Model Intercomparison Project, which is where the results of this study are used for; simulations are generally too long to include complex stratospheric chemistry. I don’t recall either claiming to be versed in climatology. Their claims have been entirely about the mishandling of data analysis and statistics in climate papers. I don’t need a degree in physics to point out that if a paper is predicated on 2+2=5.39 that it is wrong. You have a great deal of knowledge to share. It is too bad that you choose instead condescension and misdirection. Looking at the graphs in the Supplementary Information, one sees large decreases in temperature at the time of the Dalton minimum in so many of them. That was a time of low solar activity, right ? Aha! New frontiers in dildoclimatology. 1. The overall energy from the Sun is a constant. 2. Variations in Solar Magnetic Fields do not affect the Earth’s climate in any significant way. 3. Solar storms and other solar physical phenomena do not affect the Earth’s climate in any significant way. 4. Pre-industrial global temperature had a constant maximum. 5. After a volcanic eruption-caused temperature drop, global temperature would, over time, return to that constant. How could this account for Hot House and Ice Age periods in the paleoclimate? The NREC is a perfectly respectable uk organisation who funds a wide range of environment related science research including the paper under review. Are they being confused With another organisation? Tony B, you are correct, I got the acronyms conflated. Correction made – I removed the incorrect comparison. A fact for every occasion? yesterday we were being told that the heat is missing because it goes straight into the deep oceans. Today we are being told that it stays in the atmosphere and affects tree growth. I apologize if I am misunderstanding the study — I am just an economist with training in econometrics and statistics. It appears they took output from models (curve fitting exercises) that exclude solar as a forcing, correlated that output with estimated temperatures, and find there is no or minimal correlation between the model outputs and the estimated temperatures. Why is that a surprise? The curve fitting probably took care of all the external forcing, leaving no room for additional variables. Some nice hockey sticks there from Dr. Schurer. Is he going into business? What is wrong with these people ? Have they lost all common sense ? Edinburgh – town and gown – has a lot to be ashamed about in the climate arena. They gave a civic award to James Hansen. They have many academics well ensconsed on the irresponsible, odious bandwagon of climate scaremongering. There is a Royal Society of Edinburgh which is not much better than the one in London where it comes to swallowing, promoting, and eating out on the same sorry platform. The most obvious problem is that they used Mann’s tree-ring based hockey stick as their temperature target. Even if they had hit the bulls-eye, it was the wrong target. Perhaps the current down tick in solar activity, is causing some fear in academia. Models all the way down, using tree thermometers ? Might have been easier to just MSU as normal for Climatology. I never expected a so called science would make scientology look respectable. 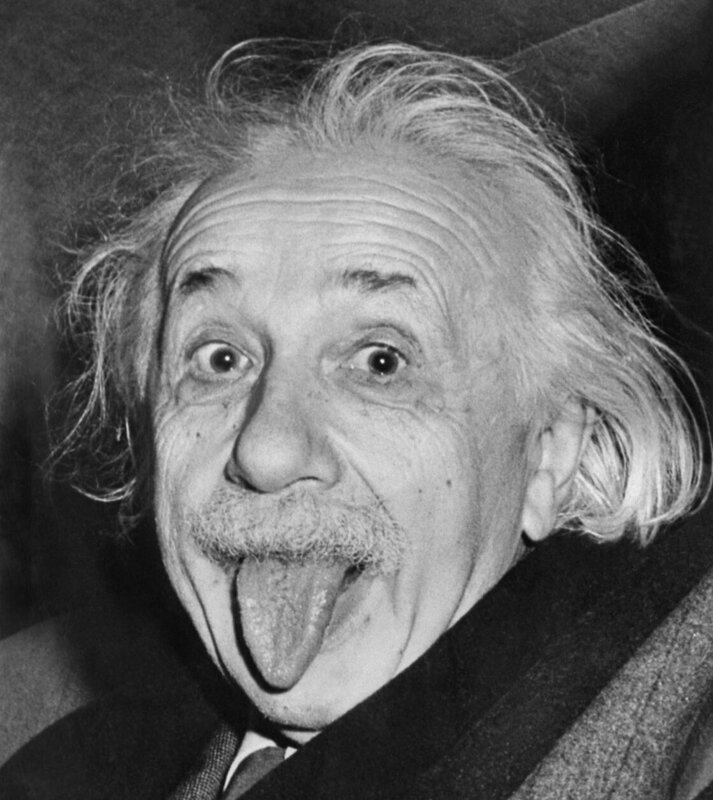 I had to write a thesis on Einstein for my MSc and on Newton for my BSc. Of the two, eistein was the most humble but still suffered from bouts of irrationality. Newton was at times a nasty political animal but a brilliant engineer and scientist. Of the two, my vote goes to Eistein. Isn’t this uni one of Bouldon’s / Boulton’s of CRU/UEA fame.? The problem for the alarmists with this paper is that we have non-rising temperatures for 17 years and no prominent volcano eruptions. So, the volcano-temperature link does nothing to restore the broken CO2-temperature correlation. Your fully baggaged mind did not allow you to see the nuance in AW’s writing. Well then, I guess that there’s nothing to fear as the sun becomes a red giant! This article is not worthy , but then again we must keep Leif happy. Anthony will not and can’t oppose Leif, even though he does not see things the same way. This site is not balanced and censors so much. Shame on Anthony, who has a good handle on the climate but yields and gives so much longitude to the likes the likes of Leif and others. UGH. I know you will not post it,(who cares) but I know you got it. On to the Layman sunspot site, much more balanced. First those seeking justice must come with clean hands. So, it seems those who claim solar activity has nothing to do with climate and or climate change should do their research out side, with no air conditioning, and say in Southwestern New Mexico or Southeastern Az. in say August each year for the study of say three years. Sounds simple, yet what if it in fact is just that simple? Surely the paper with Mann as an author that you reference is not the same as the one being reviewed here or has it been amended since it was originally written? I see that you found the word political, well done. Now where does it say that the NERC has a political mission to grab a headline? And what does that even mean? We know computer-based models are just functions based on the creator that they personally think/guess need to be included. It hides what any science there maybe in a model which we don’t have the faintest idea what is in it. All these are made up assumptions not backed up with scientific observations and cant be reproduced by another scientist. Especially doesn’t even explain the recent decades pause in global warming or global cooling during the 1940s and 1970s. The suns activity has quietened down and there is less volcanic activity during this period than previous decades, Yet global temperatures fail to warm and if it was mainly CO2 and volcanic activity that was key in climate based on this model, then how can this claim be true? Based on the key assumptions that incorrectly drive climate, CO2 and volcanic activity, there should have been warming recently. This itself falsifies the computer model simulation. Real observations including proxies show during the geological record different scientific evidence to what this model is assuming. Global cloud levels have declined during the previous warming period, so not to include this correctly in any model will always bring incorrect conclusions. A 4/5 percent decline in global cloud levels (observed by satellite) has a significant affect on global temperatures and to say the sun has no influence on this is nonsense. You have linked to a different paper than the one posted by Anthony. Was that by accident or on purpose? That is just a little ghg paradigm shift the academics in world class institutions are having. Paradigm shifts are so shocking that a whole new language and history is needed. Everything gets re-written. The lips always claim Popper, but the eyes and left hand always say Kuhn. So all the Warmists claims about warming or cooling due to the level of heat output in the PAST can be scrapped? Any future cooling will NOT be blamed on the Sun’s heat output also. The science is settled, the missing heat has to be in the deep oceans. Note to self**** bookmark this page. Paul Pierett I am in total agreement. I saw this years ACE and SSN graphs and saw exactly the same thing you did a few weeks ago, with tornado and hurricane activity tracking well with them. This is a central point I will be making in the opening minutes of my first weather-climate video out early January, that also will feature an extreme weather events analysis and a WeatherAction 2013 last quarter forecast review. Thanx to you and a growing army of others, this important over-looked point will be revealed. Which volcanoes prevented modern temperatures from exceeding Medieval Warm Period temperatures ? The two are not the same, with the former being a subset of the latter. No surprises here then! When it looks like AGW theory is going belly up,prop it up with something else. No science in AGW even less science in this pile of tosh. An increase in 8 molecules of a gas per 100,000 molecules of atmosphere will cause an apocalypse, the power of the sun turning 4,000,000 tons of hydrogen to nuclear energy every second, that totally powers our climate and weather has a negligible impact if there is say a 2% drop or increase in output? I don’t think so! So what caused the Climate’s Damascene conversion (after 4½ Billion years) in 1800? The effects of volcanos swamped by CO2 from Napoleon’s armies in their SUVs, perhaps? Do these dishonest clowns with their dodgy models really expect to be taken seriously? … figure 15 on page 34. It doesn’t relate to sunspots, but it does relate storms to temperature – and sunspots relate to temperature. It appears to be contrary to your findings, and I suspect the your relatively short time periods may be a factor. [I haven’t studied your document in detail, so apologies if I have misread it]. You are probably well aware of the work of Sir William Herschel, eg. who connected sunspots with agricultural productivity. If the Royal Society does not take your research seriously, then you are in good company – “Alas, Herschel was not congratulated by his colleagues or the Royal Society for his novel hypothesis. In fact, it was rejected and dismissed.“. Are these the same volcanoes that don’t put out significant amounts of CO2, that all-powerful ‘special’ gas with pixie dust qualities? It is interesting to see volcanoes invoked as a way of trying to minimize the influence of the solar variation on temperatures, while later the same volcanoes are ignored as influences when it is important that CO2 look as if it is so influential. This is hardly the first look at the idea. I predict that as the temperatures continue to decline for the next 15 years, one or another volcano will be blamed for it, even as the sun paints itself featureless for a decade. My first take on reading the abstract is how stupid the idea is. Volcanoes? But no influence on CO2 from eruptions, but CO2 is the cause of temperatures rising since 1900, when there was almost no CO2 of human origin. The rise in temps in the 20’s and 30’s was now cause by AG CO2 – is that the message? And the cooling that started in the 40’s was not caused by the beginning of the rise of AG CO2? They should get their story straight. The biggest volcanoes in the past 40 years were in the period when the temperature rose. That rise was AG CO2, was it? And the current temperature pause while 1/3 of all AG CO2 emitted to date is cause by what exactly? More no-CO2 volcanoes? At least in the coming years there will be plenty of useless old scientific papers to burn to keep warm. We can read them, laugh and toss them into the fire. PS Mosher – you would meet a lot less embarrassment if you simply kept quiet. We are not buying the idea of your intellectual omnipotence. Stop defending the indefensible. It is scaring the cat and it’s bad for science. Thank you. I was struggling. And Albert was right. Looks like another one of Leif’s often stated “pet theories” This one no doubt funded by the author’s newly discovered “gravy train”. More bullshite to baffle brains. Are they claiming that this methodology accounts for ALL variables and uncertainties? Is that what they are saying? Well slap my britches, I didn’t know we knew so much about the climate so as to account for all variables and uncertainties. Silly me. Since we are onto models here is a much earlier one. I guess it’s not as good as the latest, spanking new models like the ones used by the IPCC to project temperature. Assumptions don’t influence outcomes and changes in solar irradiation don’t influence climate. Of course the NERC-Natural Environment Research Council has a political agenda. It, like the US National Science Foundation, are the two named partners who created the Belmont Forum in 2009 and who now manage the Belmont Challenge to “ensure equitable economic and social development.” Here’s the post describing the Belmont Challenge http://www.invisibleserfscollar.com/the-belmont-challenge-and-the-death-of-the-individual-via-education/ from June 2012. Climate change is merely the excuse for what the OECD is now openly calling the Great Transition. Belmont Challenge fits right in with both the OECD and the UN’s transformational plans for all of us. The only way out is widespread knowledge of these intentions before they become a fait accompli. With regards to my comment about Michael Mann being a co-author. The paper I linked to “Separating Forced from Chaotic Climate Variability over the Past Millennium”, which Mann contributed to, is the the most recent listed at Edinburgh University, and published in September,. Although this now appears to be a different paper to the one that is the subject of this post, they are inextricably interlinked. Variations in solar output and explosive volcanism are found to be the main drivers of climate change from 1400 to 1900, but for the first time a significant contribution from greenhouse gas variations to the cold conditions during 1600–1800 is also detected. The proxy reconstructions tend to show a smaller forced response than is simulated by the models. This discrepancy is shown, at least partly, to be likely associated with the difference in the response to large volcanic eruptions between reconstructions and model simulations. It is clear that the second paper is connected to the first, not least for the fact that there is such a small interval between the two. The hand of Mann is all over this. As extensively demonstrated in my papers since 2007 (JGR), the strength of the solar signature on paleoclimatic climatic records strongly depends on the particular paleoclimatic climatic record that is used. If hockey-stick like temperature reconstructions are used, then the solar signature is very small. However, if other non- hockey-stick temperature reconstructions showing for example a significant MWP and LIA are used, then the solar signature is quite strong. The result of the paper derive from their usage of a kind of average paleoclimatic temperature reconstructions that however excludes several modern reconstructions showing a large pre-industrial variability. Thus, they compare against an average temperature reconstruction that is biased toward the hockey-stick like temperature reconstructions that imply a low solar effect on climate. Consequently they discovered some “hot water” already known since 2000: that is, if the past did not change much the sun does little to climate changes. For those interested in something more interesting, I have just updated the temperature of Nov/2013 in my graph showing the temperature against the forecast of my astronomical harmonic model first published in Oct/2011. The forecast worked quite well during these last two year where my model correctly predicted a slight warming. ‘ee’s not dead, ‘ee’s jus restin’. Other than saying the Earth is flat I can’t think of anything that would cause people in the 21st century to believe that all the effects within a 24 hour cycle ,including temperature fluctuations, is not due to one rotation of the Earth because that is exactly what that mainstream statement says in creating an imbalance between days and rotations. It must be wonderful chanting voodoo across at each other and hoping the climate issue will be resolved in a race to the bottom as to who is more vicious but who can imagine that to recover climate research you have to begin with the most basic experience of temperature fluctuations and the daily rotation of our planet. Amazing,amazing people – the whole lot of you !. I was about to have a look at this paper below…. For the curious here is the link Paper finds solar activity explains climate change over past 200,000 years… to the essay at the Hockey Schtick. The paper is from 2002. And stopped reading. The first sentence was too much to bear! is there a rush on studies being published for Christmas! The next step is to determine whether the reservoir helps or hinders the survival of Greenland’s icesheet. The researchers don’t know if the water will ever make its way to the ocean. Sorry your link not working. You may have a fine point, the joke being learned stupidity but how does such a oxymoron differ from the claimed accuracies for temperature anomalies, or the amazing Global average Temperature? Scientists monitoring the Cayman reefs noted a 40 percent decline in live coral cover between 1999 and 2004 during a period of warmer seas in the Caribbean. However, seven years later, the amount, size and density of the live coral had returned to 1999 levels as sea temperatures eased, according to Tom Frazer, professor of aquatic ecology at the University of Florida and part of the research team. Until we have a positive explanation for the correlation between certain measures of solar activity and global temperatures, I won’t be impressed. No amount of “it can’t be the sun” makes that correlation go away. Dr. James Hansen switched from astrology astronomy to climastrology. He published a paper back in the 1960s that blamed dust on Venus warming. When he got into climate he blamed the warming since the late 1970s on non-CO2 greenhouse gases such as CFCs. Then he moved onto soot and finally settled on Co2. What next? Cow fart? With a record like that I want a second opinion. A dust insulation model for the atmosphere of Venus is proposed in which the high surface temperature results primarily from a shielding of energy escaping from the planetary interior. The insulation is provided by micron-sized dust particles which may be kept airborne by mild turbulence…..
Mannian tree rings and computer models. Yep, got great confidence in that study (sarc off). Fine point indeed John !,when you can’t correlate the daily temperature fluctuation within a 24 hour period with one rotation of the planet and keep them in step day in and day out then the issue is not a global climate problem,it is a very troubled era populated by people too blinkered and too vicious to see the point. He may as well have said the Earth is flat because the expanded qualifiers disprove such a notion,these qualifiers are that a star returns in 23 hours 56 minutes 04 seconds of an average 24 hour cycle within a 365/365/365/366 day framework. It is not that,so enchanted were men by their use of a watch to extract the motions of the Earth that they are still willing to ignore an impossible imbalance between days and rotations even when common sense should intervene. You are bound together by hatred of each other and not an attempt to elevate the standards for climate science so forget about fine points,when a society can’t support the most basic experience of temperature fluctuations and its rotational cause within a 24 hour period then all other issues fade into irrelevance. How one can account for the ‘internal climate variability’ if its extent or magnitude is not known? Another case of numerology? I returned to the RC blog, possibly foolishly promoting solar contribution to the natural variability, where of course it was (as often is case here too) classified as numerology. I don’t know what numerology is, and I understand these graphs are simplistic, but I ask of natural variation, where’s the beef? There are only two sources of heat for our atmosphere, that from below and that big shiny ball in the sky. Neither can be perfectly constant. How can people accept paychecks for this stuff? So if the sun suddenly goes out or explodes, it will have no effect on our climate. Sounds logical to me. So I should not waste money on running my furnace this winter because it will have no effect on the temperature inside my house. Apparently that last ice age was caused by 100,000 years of extreme volcanic activity.but where is the evidence that such happened? Ice cores must be loaded with volcanic ash and particulate matter. Considering the apparent correlation between CO2 levels and temperatures in the paleoclimate record, if CO2 is a cause then it should be an H of a lot warmer then it actually is today. So apparently the oceans have not effect on our climate either. One can program simulations to provide any desired results. Actually realizing these results in the real world is the real problem. Thanks for the graph update. Remarkable. It would be nice if Anthony could post the currently updated version on the sidebar. Who says you can’t have your paradigm shift into the “Anthropocene Age” and your data too? Another clumsy, shabby, foregone-conclusion driven piece of drivel. The authors of this paper should be embarrassed at how obvious their errors are even to the uninitiated. Well CO2 is rising, and solar activity is falling, so we’ll soon see which is in control. Unfortunately there’s no penalty in academia for being wrong (eg. your pension is cut by a third for every wrong prediction). It would remove the need for peer review. People’s language would be a lot more measured. It might cramp academic expression, but who cares? Who needs wild speculation anyway? It’s costing me money. I’m not sure that applies here – their detection and attribution analysis, according to Tables S2 and S3, was based on regressions over 1000-1900 and 1450-1900, before the blade of the hockey stick takes off. 2. I’ve not come across Andrew Schurer, but Simon Tett and (particularly) Gabi Hegerl are pretty experienced in this type of study. The Hegerl et al (2006) last millenium Bayesian climate sensitivity study is pretty thorough, although I think its estimate was biased up significantly by the inappropriate prior distributions it used. The study under discussion is not Bayesian, however. 3. One issue with this sort of study is that there is much more variance in the smoothed volcanic forcing series than in the smoothed solar and GHG series. That means the regression coefficients for solar and GHG ould be dominated by incidental relationships with volcanic activity. The last part of section S3 claims that is not the case if decadal variability is used. Whilst I have no reason to disbelieve that claim, equally I have no practical way of checking it. 4. The paper suffers, so far as I can tell, from the usual climate science defect of failure to archive the data and computer code used, making it difficult, probably impossible, to verify the results. “Climate change has not been strongly influenced by variations in heat from the sun”. I cannot recall anyone seriously claiming that variations in heat from the sun have had much effect on the temperature of earth. Indeed, I seem to recall discussions regarding the mechanisms which had allowed earth to be warm in the distant past when the sun was probably providing significantly less heat. It is my understanding that claims of significant effects from solar variations have to do with indirect causes such as magnetic fields which may allow significant variations in the effect of cosmic rays on cloud formation. My suspicious nature may be showing, but is it possible that the study was deliberately designed to consider only one insignificant solar variation so that the desired claim could be obtained? Who is this Mosher that seems to be an acquaintance of yours but rarely backs up his assertions with data? The warmists are running out of time to publish goofy papers to try to pushing the extreme AGW hypothesis. The majority of the warming in the last 70 years was due to solar magnetic cycle changes. Observational proof to confirm that assertion will be significant in your face cooling, due to the solar magnetic cycle interruption. The warmists need to start working on plan B whatever that might be. TSI has dropped roughly 1.5 watts/meter^2. It is odd that there is no discussion of that fact in the media. GCR at solar magnetic cycle 24 maximum is as high as past cycle averages. There is the start of cooling at both poles. 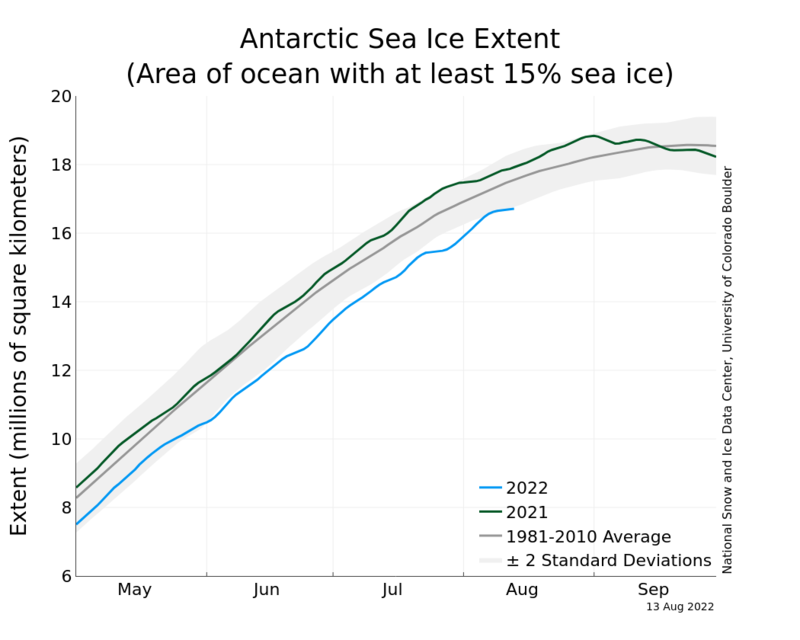 Antarctic sea ice is two sigma above average, for all months of the year, which is unprecedented in 40 years of data. 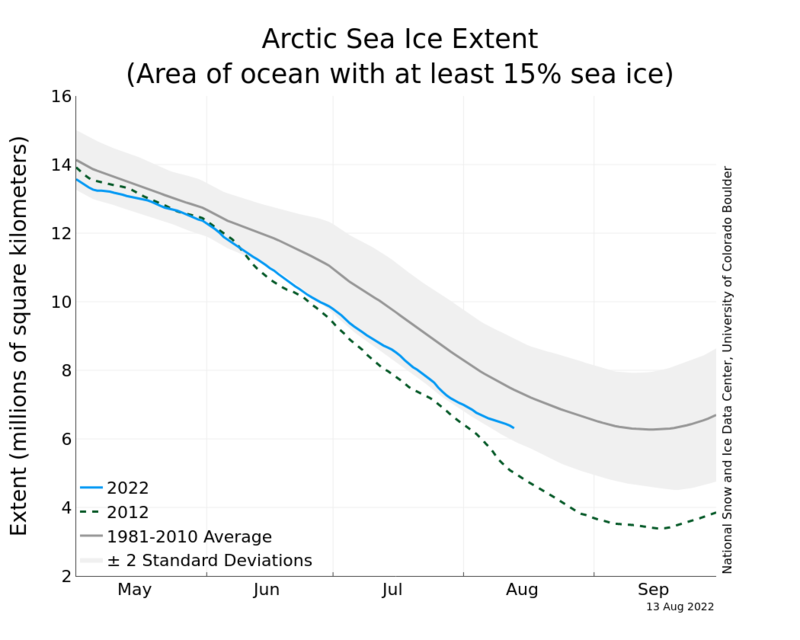 Arctic sea ice has made the fastest recovery in the 40 years of data. There are cycles of warming and cooling in the southern and northern hemisphere that correlate with solar magnetic cycle changes. The question is not if solar magnetic cycle changes modulate planetary temperature but rather how. There is no need to sweat over how the sun modulates planetary climate we can answer that by observation as the planet cools. The paleoclimatic data, covering the full span of the present interglacial epoch, are a record of the concentration of identifiable mineral tracers in layered sediments on the sea floor of the northern North Atlantic Ocean. The tracers originate on the land and are carried out to sea in drift ice. Their presence in seafloor samples at different locations in the surrounding ocean reflects the southward expansion of cooler, ice-bearing water: thus serving as indicators of changing climatic conditions at high Northern latitudes. The study demonstrates that the sub-polar North Atlantic Ocean has experienced nine distinctive expansions of cooler water in the past 11,000 years, occurring roughly every 1000 to 2000 years, with a mean spacing of about 1350 years. Each of these cooling events coincides in time with strong, distinctive minima in solar activity, based on contemporaneous records of the production of 14C from tree-ring records and 10Be from deep-sea cores. For reasons cited above, these features, found in both 14C and 10Be records, are of likely solar origin, since the two records are subject to quite different non-solar internal sources of variability. The North Atlantic finding suggests that solar variability exerts a strong effect on climate on centennial to millennial time scales, perhaps through changes in ocean thermohaline circulation that in turn amplify the direct effects of smaller variations in solar irradiance. William: In the last 70 years, the solar magnetic cycle was at its highest and longest period of high activity in the last 6000 years. The solar magnetic cycle has abruptly slowed down with the fastest reduction in 8000 years of data. Correlation is not causation unless alarmists say it is. They say it is, if and only if, it suits their “cause”. I imagine that all those ‘…not fully versed in climatology…’ who regularly do guest posts on WUWT will be quaking in their shoes – particularly comsmologists who are ascribing climate change to cosmic rays. But perhaps you are right after all. Perhaps, if we excluded all those without a strong background in peer-reviewed climatology journals, there would be not nearly as much junk commentary confusing the scientific issues. Well, ‘wondering’ provides a profound insight into the quality of the science in this study, doesn’t it? Models are used for every single large-scale and complex human activity – from ship building to space craft, to planning commercial airliner flights, to predicting pork belly futures, to predicting seasonal rainfall and temperatures for crop planning. To claim that climate models are as accurate as mechanical engineering models would be dishonest, because it isn’t true. To allude to similar accuracies in order to give the impression of equivalence of the models also falls under the heading of questionable veracity. “Climate change has not been strongly influenced by variations in heat from the sun”…. No only is there the solar magnetic field/cosmic ray possible link, there is also the fact that although TSI may not vary the composition of the TSI does vary especially in the UV and EUV wavelengths and that effect ozone formation/destruction and the “puffyness’ of the atmosphere. …Greg Kopp of the Laboratory for Atmospheric and Space Physics at the University of Colorado, pointed out that while the variations in luminosity over the 11-year solar cycle amount to only a tenth of a percent of the sun’s total output, such a small fraction is still important. “Even typical short term variations of 0.1% in incident irradiance exceed all other energy sources (such as natural radioactivity in Earth’s core) combined,” he says. Isaac Held of NOAA took this one step further. He described how loss of ozone in the stratosphere could alter the dynamics of the atmosphere below it. “The cooling of the polar stratosphere associated with loss of ozone increases the horizontal temperature gradient near the tropopause,” he explains. “This alters the flux of angular momentum by mid-latitude eddies. [Angular momentum is important because] the angular momentum budget of the troposphere controls the surface westerlies.” In other words, solar activity felt in the upper atmosphere can, through a complicated series of influences, push surface storm tracks off course…..
Total solar irradiance (TSI) may present the same long-term variation as the solar cycle length (SCL), corresponding to the Gleissberg cycle. It is expected that when SCL decrease, TSI increase. The analysis of stratospheric, ionospheric and solar data suggesting that UV and EUV solar radiation have long-term variations that do not depend on the sunspot number, Rz. The part of the UV and EUV solar flux associated to SCL, called UV(SCL) y EUV(SCL), varies in such a way that when SCL decreases, this radiation decreases. Direct indices of EUV and UV available data support this hypothesis. Through ionospheric data we estimated that EUV (SCL) is 1% and 2% of the total EUV solar flux, for a short and a long solar cycle respectively. …Results from Nimbus-7 suggest that TSI varied by about 0.14% (2 Watt/m2 peak-to-peak over a period of about 11 years (1979–1992). This does not rule out larger changes occurring over a greater period of time. Space and time variations of meteorological parameters are mainly due to the visible/infrared solar radiation intercepted by the Earth, while the main body of the ionosphere arises from atmospheric absorption of solar radiation in wavelengths less than 102.6 nm (EUV). The spectral range mainly involved in stratospheric heating is from 200 to 300 nm (UV)…. The maximum ionospheric electron density anomaly NmaxA is in phase with SCL in the period 1949–1995. Thus SCL appears to be a possible indicator of long-term changes in EUV solar radiation at wavelengths < 102 nm. The lower stratospheric temperature anomaly LSTA in the period 1979-1994 is in phase with NmaxA. If this association holds outside of the data period indicated, LSTA should be in phase with SCL. In this case SCL could be considered as a possible indicator of long-term changes in the 200 to 300 nm solar spectrum range. These results suggest that EUV and UV solar fluxes are composed of two terms, one associated to Rz variations and other to SCL variations. The first term increases with decreasing SCL as the second term decreases, and the first term decreases with increasing SCL as the second term increases. Direct indices of EUV and UV for 1979-1996, when SCL decreased, support the assumption that the UV and EUV terms associated to SCL variations decrease when SCL decreases. A rough estimation of the EUV variation associated to SCL based on ionospheric data, indicates that EUV(SCL) is 1% and 2% of the total EUV solar flux, for a short and a long solar cycle respectively. Althouhg this variation is quite small in percentage terms, is much biggern than the 0.25% expected in TSI, so it should be taken into account in atmospheric processes involving long term variations in UV and EUV solar radiation (i.e., ionization processes, ozone depletion, stratospheric temperature variability). Since only two consecutive cycles (19 and 20) have been considered, and not the maximum and the minimum of the 80-90 year oscillation, the estimated value of 142% for the ratio EUV(SCL)1 to EUV(SCL)s would be the minimum variation expected. I think you’re right Anthony about the authors inexperience with climatology. It’s well known within the climate science community that anthropological greenhouse gas quantities are mostly irrelevant before about mid 20th century. When the author suggests that 1800 is the starting point, which coincides with the start of the industrial revolution, it shows that this is not a scientific paper, but rather a political essay. I’ve seen this mentioned a couple of times but it’s a misleading figure, It does not the earth is receiving 1.5 w/m2 less energy 24/7. Averaged over the whole surface, the earth receives about 240 w/m2. A reduction of 1.5 w/m2 in TSI would translate into an average decrease of just 0.26 w/m2 and a temperature decline of less than 0.1 k.
And this is also not correct. The supposedly huge volcanic activity of the LIA should be pretty easy to track to each individual volcano and its location, type of eruption… or would that be too much for those climatowriters? There are a number of different kinds of computer models. Some models consist of algorithms that manipulate data structures. They sort, graph, schedule… They do what humans can do, but much faster. These are not climate models. Computer models of the mathematical continuum fall under two categories. Those that discretize the math under consideration for numerical analysis (this is the kind Mosher likes to reference). These types are not climate models. The second category does no use a mathematical model directly, because one does not exist. It is an amalgamation of the other types, a pseudo model of the real world. There doesn’t yet exist a mathematical equation for earths climate, and there isn’t sufficient computer resources yet to faithfully reproduce the earths climate for sufficient periods of time to be useful. The subset, weather models, are only good for up to about 7 to 8 days. Some of your examples actually confirm what the skeptics have to say about models. What is the range of error for example in planning commercial flights? There are many things within the human domain that have not yet been modeled sufficiently for predictive purposes. The predictions from Environment Canada for the next quarter temperatures has been shown to be worse than random guess for example. Thank you Nic Lewis for your frequent, knowledgeable comments. Flinn: I’ve seen this mentioned a couple of times but it’s a misleading figure, It does not the earth is receiving 1.5 w/m2 less energy 24/7. Averaged over the whole surface, the earth receives about 240 w/m2. A reduction of 1.5 w/m2 in TSI would translate into an average decrease of just 0.26 w/m2 and a temperature decline of less than 0.1 k.
William: You miss the point. The abrupt reduction in TSI supports the assertion that solar magnetic cycle 24 is an abrupt change to the solar magnetic cycle. The sudden reduction of TSI of 1.5 watts/meter^2 or 0.26 watts/meter^2 averaged over night and daytime and making allowance for a sphere is significant. The highest multiple month sea ice around Antarctic in 40 years is an abrupt change. The largest increase in Arctic sea ice in record is an abrupt change. Abrupt changes require a physical explanation. The planet was started to cool, the reason for the sudden cooling is the solar magnetic cycle 24 change. The gig is up. …and promptly started reading the comments. No…You are presumably using solar irradiance data that is measured in terms of W/m^2. That is per m^2 where the Earth intercepts an amount equal to pi*R^2. The W/m^2 forcing that CO2 causes is per m^2 of the Earth’s surface, which has 4*pi*R^2 of surface area. Hence, you have to divide the change in solar irradiance by 4 to get the amount per m^2 of the Earth’s surface. Furthermore, not all of the incident radiation from the sun is absorbed by the Earth…About 30% gets reflected…So, you have to then multiply by a factor of 0.7. So, in fact, the forcing from the solar cycle is a lot smaller. It is also worth noting that its effect is further reduced by thermal inertia effects…I.e., the 11-year cycle is fast enough that the Earth is not able to equilibrate with the current solar forcing and this causes a further dampening of the solar effect. (You see this even more dramatically for the diurnal cycle: After all, on a local scale, the solar irradiance goes to zero every night but the temperatures don’t plummet accordingly. Part of this is attributable to the transport of heat around the surface but a lot (probably most) is due to thermal inertia effects. A couple of posters have responded to my comment on models.They made points about models and general and some models in particular. These points may, or may not, be reasonable. But these comments miss my point: if you want to diss a particular model, for whatever set of reasons, you have to diss the model being questioned… not some other model(s). The next step along this slippery slope – dissing all models simply because they are models – is simply unsustainable. Our civilization would grind to a very rapid and messy halt without the constant application of myriad models. Meanwhile, back in the real world …..
No, Nic, That is irrelevant. The hockey-stick like temperature reconstructions claim that the temperature before 1900 varied very little, about 0.2-0.3 C. If the temperature varied so little from the MWP and the LIA then solar changes could only effect climate little, by 0.1-0.2 C, the vocanos get another ~0.1-0.2 C. This is independent of what happens after 1900. The new temperature reconstructions present a much larger preindustrial variability from MWP to LIA (0.6 C and above). In this situation the solar effects must be increased to about 0.5 C (and above), while the volcano cannot be increased because the volcano cooling spikes provide an upper limit. Read my recent papers, for example. Problem is that all models are merely the figment of the modeler’s imagination (or his/her very limited understanding of stuff). The Sun is currently in its lowest solar cycle since 1906 and it peaked this year, so it only weakens from here. Over the past 20 years, solar activity has been falling at its fastest pace in 10,000 years, which seems to explain the lack of a warming trend since November 1996. Combine this with the collapsing Umbral Magnetic Field, an excellent case can be made that the next solar cycle will be even lower than the current one, and could well be the lowest since the end of the Maunder Minimum in 1715. If global temps continue to decline (HADCRUT4= -0.02C/decade since 2001), while record yearly amounts of CO2 emissions are observed, the CAGW hypothesis cannot survive the validation parameters of the Scientific Method. It just seems a matter of time before CAGW won’t pass the giggle test and is finally thrown on the trash heap of failed ideas. The next step along this slippery slope – dissing all models simply because they are models – is simply unsustainable. I only diss models that have been, without fail, complete and utter failures for over twenty years — which means I only diss climate models. Imagine if jets were crashing every time they took off for twenty years and running, and the aeronautical engineers defended their models by looking for “the missing lift”. It’s laughable and beyond defense. Your straw man argument is as weak as the models you defend. Then this graph is all wrong. It show volcanic eruption as the climate climbed out of the little ice age not too much activity coming out of the MWP. Author Robert Brulle teaches Critical Theory, related to Marxism and Postmodernism. Basically an social pseudo-science activist. Nobody disses all models simply because they are models. This is known as a ‘knocking down a strawman’. I personally lump climate models together in general because the IPCC is fond of using ensembles of climate models, apparently to poor effect in projecting future temperatures. It has been suggested many times, at least some of which I believe I’ve seen in the comments here on WUWT (although I may be mistaken and have no intention of digging around to verify) that perhaps it would make more sense to exert some effort to separate the ‘better’ models from the ‘poorer’ ones (skipping a lot of interesting detail), although it still doesn’t seem to have occurred to the IPCC that it would be beneficial to do so. In short, perhaps your time would be better spent heckling them about how all models are not equal. Merry Christmas, in case we don’t speak again. If I can be of any further assistance, please don’t hesitate to ask. …The next step along this slippery slope – dissing all models simply because they are models – is simply unsustainable. Our civilization would grind to a very rapid and messy halt without the constant application of myriad models. Models are only as good as the data and formula used to build them and they are completely worthless if they are not validated by actual real life experimental data. As a chemist in manufacturing I have generated that experimental data to validate the computer models I helped designed. We tossed out a heck of a lot of models because experimental data showed they were complete garbage. This is the critical step missing in IPCC climate science. The last assessment report show the climate models need to be tossed on the scrap heap but that is not what is happening. Instead they get renamed ‘projections’ and used to determine the economic policies of whole countries. William: The AGU conference solar update noted solar UV had declined 20%. Are you asserting that TSI has not dropped 1.5 watts/meter^2? The same panel (of which you were a member) noted solar heliosphere pressure had dropped 40%. Solar large scale magnetic field strength has dropped 50% (solar cycle 22 to solar cycle 24). Antarctic sea ice is now above 2 sigma higher than the forty year average for every month of the year, which is unprecedented in 40 years of observations. Arctic sea has made the fastest recover in 40 years. The planet has started to cool. CRF (cosmic ray flux, mostly high speed protons) is the highest ever observed with instrumentation for this period in the solar cycle. There are at dozens of paleoclimatic observations and current observations that logically support the assertion that the majority the warming (70% to 90%) in the last 70 years was due to solar magnetic cycle changes. Shaviv’s estimate is conservative at 0.3C to 0.7C. William: For example: As CO2 is more or less evenly distributed in the atmosphere the potential for CO2 warming is the same for all latitudes. The actual warming due to CO2 is linearly dependent on the amount of long wave radiation at the latitude in question before the increase in CO2. As most amount of long wave radiation that is emitted to space is in the tropics the most amount of warming due to the CO2 increase should have occurred in the tropics. That is not what is observed as shown in Bob Tisdale graph. The following is a peer reviewed paper that supports the above assertions. There has been no refutation of my original point: that if you want to diss a model, you need to diss the model – not some other models that may or may not be like it, and not models in general. The abrupt reduction in TSI supports the assertion that solar magnetic cycle 24 is an abrupt change to the solar magnetic cycle. There has not been a abrupt reduction in TSI and SC24 is not an abrupt change, just a replay of cycle 14. Earth to climateace: As Reg Nelson says, we’re only dissing bad models here, not models in general. As 97% of the predictions / projections made by the climate models used by the IPCC fail to conform to reality, they deserve dissing. They’re utter garbage. Figure S7 of this paper has the MWP about completely deleted, also practically deleting the pre-1790 portion of the LIA, in an absurd hockey stick. This paper’s temperature history and model verification is way wrong. GIGO applies: Fit something to match garbage, and garbage is the result. The paper includes for figure S1 a partial albedo history in which ice cover, natural vegetation change, and cloud cover change going into the Little Ice Age is not depicted but yet human influence on cropland versus forest is depicted, classic for CAGW-movement authors for whom natural influences are to be understated compared to manmade ones. And more could be listed wrong with it, including the classic superfluous model tactic to avoid showing all work in the paper itself, to hide more BS where readers don’t see it. Of a little side interest despite the junk in other sections, their volcanic reconstruction has times of exceptional volcanic activity at each of the four solar Grand Minimum points they mark with arrows in Figure S6, quite like people of a very, very different perspective who argue for a magnetic coupling mechanism. However, trying to explain the history including at the decadal scale and later in http://img250.imagevenue.com/img.php?image=45311_expanded_overview2_122_15lo.jpg with volcanic eruptions rather than the solar-cosmic-ray forcing illustrated there many times over would be an exercise in ludicrousness (or in lack of honesty which is practically a filter for whether an educated individual may like and be inclined to support the CAGW movement). As Dergachev et al 2004 noted (full-text online copy of paper at location noted within previous link), known data proves that, primarily solar-modulated, “cosmic rays were the main factor” changing the climate over thousands of years. As Shaviv 2005 noted, the natural contribution from such “comes out to be 0.5 +/- 0.2K out of the observed 0.6 +/- 0.2K global warming” over the past century. The authors used a single model – not a lot of models. No-one on this string has actually had a close look at the model. Yet all relevant posters have had no hesitation in dissing it. My point stands. Until someone unpicks the model used, then no-one is in a position to diss it. climateace says “There has been no refutation of my original point: that if you want to diss a model, you need to diss the model – not some other models that may or may not be like it, and not models in general.“. climatace, your point has been ably refuted by four commenters, SteveB, Reg Nelson, Mark Bofill, Gail Combs. Their reference point is a model. Isnt is wonderful to live in such a fantasy world, where reality is defined first by how one wants to define it, and then the cause of this invented reality can be deduced. If that is how these people really think, there is little hope for them. As Seinfeld would say, thats how people think in the bizarro world, not the real one. be sure they didn’t just copy and paste from a few older ones? I’d like to see just what their literature search, if they did one, turned up. Nice one, my point entirely! Louis Hofffstetter, Sorry I did not make myself clear, I was talking about the picture of the Solar System you submitted. I don’t think anyone here claims CO2 influences weather. There is a diffuse effect from CO2 with only a small seasonal variation, no diurnal variation and no variation over regions or two week intervals. If anything, CO2 should have a moderating effect on weather. UK was hit by again by a storm last night, and another is threatening Scotland later today. Click on your location to get wind velocity. It is an observational fact that there has be an abrupt reduction in total solar irradiation of roughly 1.5 Watts/meter^2 (solar UV radiation has dropped by 20%), that solar heliosphere pressure has dropped by 40%, that the solar large scale magnetic field has dropped by 50% (cycle 22 to 23), that cosmic ray flux is the highest ever directly measured, and the magnetic field strength of newly formed sunspots continues to drop. The questions to answer are: 1) What is happening observational to the sun now, 2) Why it is happening?, and 3) What are the implication s of what is happening to the sun for solar cycle 25?, and 3) How will solar cycle 25 affect the climate of the earth? You cling to one solar observation – the sunspot count – (solar cycle 24 is not the same as solar cycle 14, as solar cycle 15 was not a Maunder minimum and solar cycle 25 will be a peculiar once in 8000 to 10,000 year flat line solar magnetic cycle minimum.) ignoring the fact that the magnetic field strength of newly formed sunspots is decaying linearly and the observations the support the assertion the reduction in the magnetic field strength of newly formed sunspots has profound implications for the solar magnetic cycle and for the climate of the earth. The key solar observation (if one is interested in understanding what is happening to the sun now, why it is happening, and what will happen next) is the magnetic field strength of newly formed sunspots is decaying linearly. This has never been observed and there is no explanation as to why the magnetic field strength of newly formed sunspots could and would suddenly (I repeat suddenly) start to decay linearly. The standard solar dynamo model has the magnetic flux tubes (the magnetic flux tubes are buoyant) that rise to form sunspot groups on the surface of the sun formed at the solar tachocline which is the narrow calm region which is the interface between the solar convection zone and solar radiative zone. As the magnetic flux tubes are buoyant they require a calm place that has mechanism to hold them while they are growing in strength and then to release the magnetic flux tubes. The magnetic field strength of the flux tubes that rise up from the tachocline to form sunspots on the surface of the sun require a magnetic field strength of roughly 20,000 to 30,000 Gauss (Eugene Parker’s calculation) to avoid being torn apart by turbulent forces in the convection zone. As the magnetic field strength of the flux tubes weakens the turbulent forces in the convection zone which the magnetic flux tubes must face as they rise up to the surface of the sun start to tear the flux tubes apart. At the point in time when the flux tubes are just starting to be torn apart the sunspot group that forms on the surface of the sun is made up of many small sunspots with increased occurrence of mixed polarities in the sunspot group. The third stage in the solar magnetic cycle interruption process is no sunspot group (the dark areas which are called sunspots are no longer observed) and only a region of magnetic flux. The fourth stage (not final stage, a mechanism is required to restart the solar magnetic cycle, note this is a once in 8000 to 10,000 year event, an interruption to the solar magnetic cycle not a Maunder minimum ) is the complete cancelling of magnetic flux created. The tachocline dynamo model requires the residue magnetic field old sunspots from past sunspot cycles to form new magnetic flux tubes to create new sunspots. 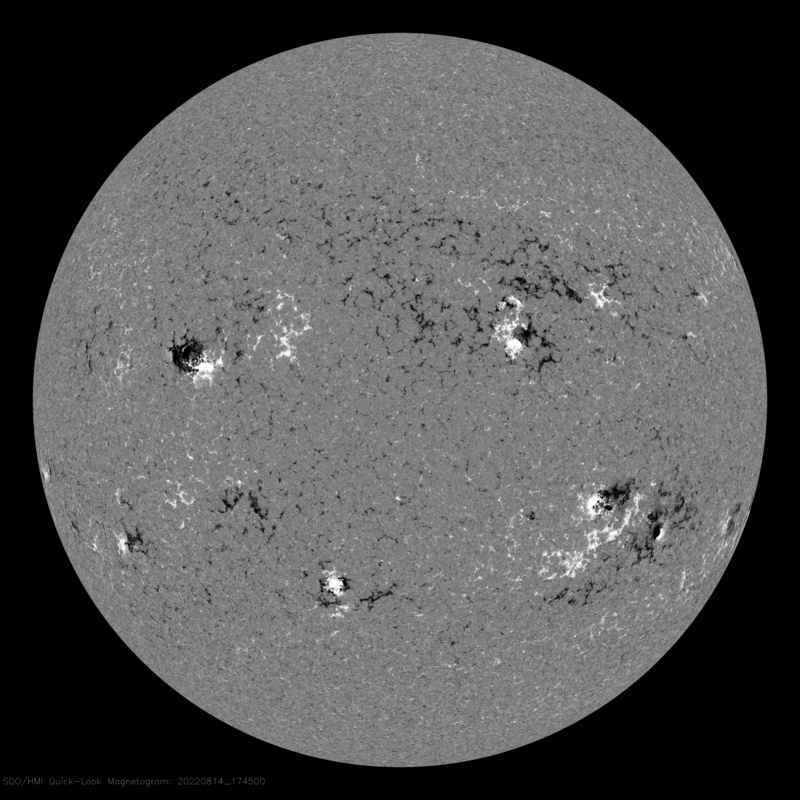 The residue sunspots are dragged down to the tachocline, form the poles of the sun by the circulation system in the convection zone. That mechanism explains the butterfly pattern of the solar magnetic cycle. As can be seen there are no visual sunspots in the solar Northern hemisphere only regions with magnetic fields. The solar Northern hemisphere is roughly 14 months ahead of the solar Southern hemisphere in the dynamo interruption process. There are still visible sunspots groups in the solar Southern hemisphere. Based on what has happened in the solar Northern hemisphere there will be no visible sunspots in the solar Southern hemisphere by roughly quarter 4 of 2014. I thought that this is a impressive paper and that cosmology is quite appropriate as a discipline to study the effect of the Sun. I found interesting the inclusion of volcanic activity during the 19th century which I have not seen in earlier models. Unfortunately I do not have the time to search for the reported claim that CO2 has been the dominating factor since 1900. I did not find such a claim, but I do agree that any such claim would be a serious short-coming in a paper. My own research indicates that in the period 1900 to 1920 industrial activity was insufficient to make much impact on global atmospheric CO2 and the research of others has indicated that the use of fossil fuel did not begin to impact much the level of atmospheric CO2 until after 1950. The paper claims that the model incorporated internal climate variations. But I did not see discussions of the ENSO, PDO, AMO in the SI. It’s difficult for the public to know whether or not public funds have been wisely spent when the product is kept behind a pay wall. But on balance I think this is an interesting paper even though I personally lean to Svensmark’s theory. My own research indicates that in the period 1900 to 1920 industrial activity was insufficient to make much impact on global atmospheric CO2 and the research of others has indicated that the use of fossil fuel did not begin to impact much the level of atmospheric CO2 until after 1950. Based on what evidence ? and puleeze don’t say models. Well that has been the trivial assumption and is the immediate impact. The rise in stratospheric temperature is a result of the incoming solar energy getting blocked at high altitude where much of it gets radiated back to space. What has not been recognised in this trivial view of is what happens in climate once the dust has settled. Here we see a definitive drop in TLS of about 0.5K after each of the major events in the record. That means that the long term (decadal) effect is an INCREASE of energy entering the troposphere. An exaggerated estimation of the cooling effect of volcanoes is what lead to the over estimation of positive feedbacks adding to the real effect of CO2 . That works fine while you have both but as we’ve seen in the last ten years, becomes obviously wrong once on of those elements is not longer present. Which makes the study about as credible as Piers Corbyn’s work. With respect that is not actually true is it. To verify if the model is any good it is compared with scientific observations to back up the claims. This can and has already been commented on and how can anybody on this forum by just looking at the link verify what the model contains. People can only comment on what is available and the details of this model are not available. I will reiterate what has already been observed before. 1) The key claims for this one model is that CO2 and volcanic activity is what only matters, anything else is minor or insignificant. 2) To back this up we can look at how this fits into just the past century to see if this claim is any good. 3) Verify model claims with scientific observations. Despite CO2 levels rising all that time the planet has had two major periods where global temperatures didn’t rise. This duration is a lot longer than the short warming period where all this AGW madness came from. Why has the global temperatures not risen for most of the period despite CO2 levels rising increasingly all the time? Well according to this model it must have been to do with volcanic activity because it doesn’t recognize anything else that can make these modest changes highlighted before. SAOT levels detect aerosols in the stratosphere from volcanoes at the only atmospheric level that can affect global temperatures. Above, the data shows volcanic activity that affects the stratosphere has declined since 1979 and recently has been at its lowest levels recorded. Notice how global temperatures have failed to warm since the SAOT levels have actually significantly declined after the last major volcanic eruption (Pinatubo) back in 1992. Therefore the conclusion here is that despite higher CO2 levels and failed warming, volcanic activity doesn’t explain the non-warming period. Hence, do observations back the model, NO. Over the past 20 years, solar activity has been falling at its fastest pace in 10,000 years,…. Yet global temperatures are still higher than 20 years ago. Perhaps the Edinburgh paper may have a point after all.
!) Since when do oceans lose or gain energy immediately? 2) Since when global albedo (snow,ice clouds) change to same levels immediately? 20 years ago global temperatures would have been warmer if it had not been for Pinatubo back in 1992. As any amateur radio operator (HAM) will confirm. There is much more to the sun than is measured by TSI. There are huge shifts in radio propagation within solar cycles and between solar cycles. Most people are unaware of this, because they mostly rely on “line of sight” radio transmissions. However, during strong sunspot cycles, truck drivers using CB can communicate over thousands of miles, and HAM operators can communicate around the world using radio’s no more powerful than 100 watt light bulbs. These shifts in radio propagation are not a few percentage change as measured by TSI. They are many orders of magnitude change in signal strength. Are we therefore to conclude that the 300 years of warming since the little ice age are due to a decrease in volcanic activity? Are we to conclude that the minoan, roman, and medieval warnings were a time when there were not volcanoes erupting? The problem is that volcanoes are a form of positive confirmation. If temperatures cool, researchers search for volcanoes and say the volcano caused the cooling. However, this is simply random chance. The same sort of confirmation that gives rise to superstitious beliefs. If you want to prove that volcanoes affect climate, you must looks at the warm periods and prove that there were no volcanoes. My point being it only affected short periods of time (look at the graph linked above) and cant explain most of history including the recent pause and cooling between the 1940s to 1970s. Major volcanic eruptions like that of 1992 would have to occur for hundreds of years to keep the globe at that level. No evidence anywhere that this happened. On the contrary, the problem is chaos. It makes a mockery of our attempts to build reliable models of time series data. We can’t do it for atoms, planets, or stock markets. Yet climate science assumes it can be done for climate. Where is the mathematical foundation that climate is well behaved, such that it is a suitable candidate for deterministic modelling? The problem is that we have no finite mathematical solution for dealing with more than two independent objects in motion. With two objects the future is deterministic, we can calculate what will happen. However, when you add a third the nature of the future changes. The future becomes too complex to calculate exactly. For all practical purposes you cannot determine the future, you can only supply a probability. OK, I get your point. If temps 20+ years ago were warmer without Pinatubo, then the current “pause” in warming would today be 20+ years, not 17 years, which would be even more of a problem for the models to explain. For all practical purposes you cannot determine the future, you can only supply a probability. the same problem applies to hincasting the past. You are hindcasting under the assumption that the past is deterministic, but it is not. The past is a probability, just like the future, so the uncertainty due to the probability function quickly overwhelms your statistical calculation of variance, making the hindcast meaningless. What you see as correlation is nothing more than chance. Of the near infinte number of paths from the past to the future, you are assuming that that the path that we took to the present has special meaning. This is the Victorian era assumption of the clockwork universe, that there is only one path from the past to the present to the future. We now know that the universe at a fundamental level does not work that way. There are a neat infinite number of ways to arrive at the present from the past, and none of them are more significant than the other. The path we arrived on is simply due to chance. So, when you hindcast the past you must include all possible ways we could have arrived at the present, and not give any special weight to the path that we happened to take by chance. No, there is a solar cycle variation of TSI [no abrupt change] of 0.1% [or 1.3 W/m2]. This happens in every cycle. The PMOD data you show have a problem with sensor degradation and the purported lower TSI values for the last minimum are in error [too low] by about 0.25 W/m2. ALL flux tubes are ALWAYS torn apart in the convection zone, then reassembled at the surface. There is no ‘interruption’ of the cycle. Based on what has happened in the solar Northern hemisphere there will be no visible sunspots in the solar Southern hemisphere by roughly quarter 4 of 2014. It is quite normal for cycles to show such asymmetry. Figure 7 of http://www.leif.org/research/ApJ88587.pdf shows the asymmetry for Cycle 14. Cycle 24 is begiining to look like 14, so nothing out of the ordinary. Are they talking of TSI? What about UV variations? What about magnetic field variations? They used treemometers data and compared with models. How did they do that? Made minor changes in TSI? OK and found that their minor changes in TSI did not reflect major changes in their model? They found some correlation between TSI and temperature and say that is all? They eliminated a factor that they do not understand how it impacts the Earth based on the results of a model that did not had the means to model the complex interaction between Sun and Earth. The conclusion is wrong, it does not prove missing Suns influence on the climate, but the modellers inability to model it. Study shows: model not able to model past climate based on TSI. Study suggests looking at volcanoes and greenhouse gases, however this has been already done, Genghis Khan has already been brought up to explain Little Ice Age as well as the Conquistadores and the farting megafauna to explain Younger Dryas. Do they really want to bring up more such studies? As we have a very interesting live experiment with the Sun getting quiet we will have very soon more data to look at. I certainly haven’t had a close look at the model, that’s correct. You complain that I shouldn’t diss the model without first inspecting it closely? Diss is a fun but vague word. If memory serves it means ‘disrespect’? Well, I don’t think I’m doing that. I’m not disrespecting anything, I just don’t accept by default that a model is good because somebody says so. Further, I don’t think the burden is on me to validate the model. If somebody comes and tells me they’ve got a model that accurately models something, if they want me to believe that their model accurately models something they are going to have to show me how they verified and validated the model. I have neither time or inclination to try to get through that mountain of work (because it is pretty darn difficult to validate some models) regarding every model and claim I bump into. For free. On my own time. No thanks! If somebody can’t show me up front evidence that they verified that the model is accurate and useful in some well defined context, then they can go fish. Now, you can stick your fingers in your ears all day long and say ‘la la la, my point stands.’ Your argument is not persuasive, because it shifts the burden of work that should properly have been done by the scientist to anybody who cares to question the scientists claim. At least, I don’t find it persuasive. Besides, sticking your fingers in your ears and saying ‘la la la’ is annoying. It’s going to get you on Santa’s naughty list and you’ll end up with a bag of solid fossil fuel for Christmas if you’re not careful, so go on and be good for goodness sakes! The oceans don’t appear to be losing energy at all. Aside from that, I thought that temperatures were depressed throughout the Dalton Minimum. In fact, judging by the CET record a temperature decline occurred several years before the “Dalton cycles” began. If the models produce useful predictions after the modeler is dead, I’m a believer. The oceans are always losing energy and being topped up again by the sun on daily basis. It is fair to say the oceans have been increasing energy over recent decades, (at least at the surface) hence the warming in the 1980s and 1990s. There has been a change in the upper depths over recent years showing slight cooling. I read the abstract of the paper, and also the abstracts of some of the papers he references in this paper. Come on, really? Give me a break. There is no ocean cooling. This is the CET record from 1772. Though there are cyclical fluctuations (probably related to the AMO) the trend between 1772 and 1900 is flat. There is no obvious “recovery” from the Dalton. Until the 1990s, the 1730s were the warmest decade in the CET record. It must be true. Yesterday morning (Xmas eve) the sun rose here a little before 7:30am and by 9:00am the temperature had already dropped 3 degrees. 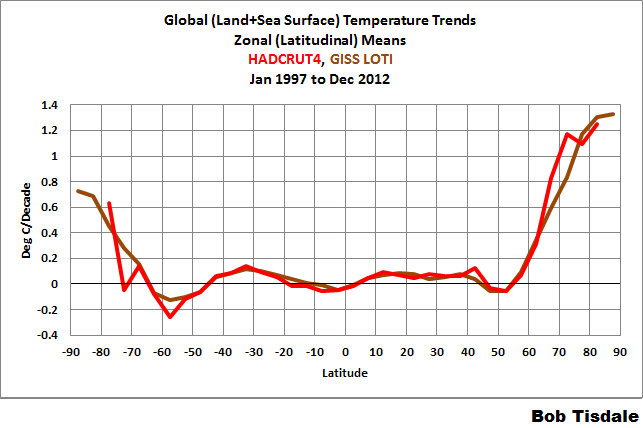 The surface is cooling recently, the 0-700m depth is warming much lower rate than before. In the link the recovery occurs from 1900 after the Dalton and this is more obvious with a slow gradual warming and during that length of time cant be blamed on AMO or PDO. This gradual warming changes the pattern before, when there should have been a significant cooling again continuing the previous pattern. For example between the 1920s and 1930s should have a cooling near -1c before warming significantly after. Gail Combs (December 23, 2013 at 4:10 pm) – you’re showing more reasons to believe and assert that the weather and climate changes are controlled largely by solar (& cosmic) photons, protons, and electrons, not downwelling LWR from carbon dioxide. Thank you for that. Seems the writers of this article are really not very adept or even up to date on the different mechanisms found in the solar variation over the millennia.. The new “AVERAGE” of GCR due to lower solar activity.. They graph is pretty telling..
NPR news was talking about Wisconsin yearly’s. April, May, June cooler and wetter. Cooler and wetter go hand in hand.. I have been waiting for the changes .. believing that mankind has had an effect .. but that the systems that affect natural variability are stronger .. there would be a longer delay .. before the recognizable change would be evident..
Our summer was late. And now our January temps were here in the first part of December. And don’t ask about snowfalls..
Carla thanx for being part of the paradigm shift. Svensmark looks better every day. Get a clue you darned real climate deniers: its photons, protons, and electrons – not carbon dioxide – that have the controlling influence over weather and climate metrics. Though there are cyclical fluctuations (probably related to the AMO) the trend between 1772 and 1900 is flat. Thank you Paul. That is a great presentation to read through. So any type of heating must then have a negative feedback. If this paper holds up, we have strong support for the thermostat hypothesis. The TH doesn’t need only CO2 heating to go into action. It would be interesting if the “small” effects have a measurable lag. No don’t, especially in Siberia. Err the US is not the World – though I note it’s inhabitants can tend to think that. In a word – the climate is a complicated thing and if somewhere is colder – that also also means there is somewhere warmer. That’s how it works. In a regional sense it just does. That’s not how “it” (weather) works. Colder weather in one region may or may not be offset by warmer weather elsewhere, especially in winter. Likewise, unusually warm weather may or may not be offset by colder weather elsewhere, especially in summer. One reason is that the weather dictates regional albedo and albedo rising or dropping in one region has no affect on any other region. If there is a coincidental drop in albedo worldwide over the short, medium or long run, then there will be will global warming in that same time frame with a potential lag from thermal inertia. Another reason is that weather controls the distribution of water vapor. If water vapor is concentrated then there will be cooling. If spread out, then warming. For example models that are run with more concentrated convection show global cooling. Just one of many ways that weather controls climate. and this clown calls himself a Doctor?? if the influence is so POORLY understood, why the high confidence in CO2?? Heellooooo!!! Not a good start to a career in science. At least he likely won’t need to wait very long to see himself proven wrong. Did you not notice the word “past”. Past as in hundreds of millions of years. We know within 10th’s of a percent what energy the Sun is kicking out now and what the variation in the solar cycle is (~0.2%). And it’s not responsible for the warming during industrial times. I beg to differ Bob. Svensmark’s theory has been found by CERN to be orders of mangitude below the necessary to create hydrophilic neuclei. And the power contained in CR, (not photons – as they are the vast majority of the Suns output), and electrons, are again orders of magnitude below the total output received by the earth’s atmosphere. And that always supposing they get through to the Troposphere. It is accepted that an effect is likely for CR but they are galactic not Solar and serve only to stir the atmosphere a bit from the stratosphere. There is no extra energy added to the system. ammonia which may be important in the atmosphere. CR/Global Warming connection (in the absence of unphysically long phase lags). There are other arguments against a CR/Climate correlation, not referred to above. ionization changes (Erlykin et al., 2009c). “Numerous searches have been made to try establish whether or not cosmic rays could have affected the climate, either through cloud formation or otherwise. We have one possible hint of a correlation between solar activity and the mean global surface temperature. This is comprised of an oscillation in the temperature of amplitude ±0.07° in amplitude with a 22 year period. The cosmic ray data show a similar oscillation but delayed by 1–2 years. The long term change in the cosmic ray rate is less than the amplitude of the 22 year variation on the cosmic ray rate. Using the changing cosmic ray rate as a proxy for solar activity, this result implies that less than 14% of global warming seen since the 1950s comes from changes in solar activity. Several other tests have been described and their results all indicate that the contribution of changing solar activity either through cosmic rays or otherwise cannot have contributed more than 10% of the global warming seen in the twentieth century. Just a hobby for me..
Svensmark has a part of the puzzle. Like carbon dioxide is a part of the atmospheric puzzle. Another puzzle is the current N. Hemisphere phenomenon, with the western hemi major portion of the U.S. having the frigid arctic blasts looming and hanging out since the beginning of Dec. Whilst the eastern hemi Russian area is experiencing above normal temps for Nov and Dec. Is this a stationary condition or just slow moving. Or is it that over the solar cycle the LOD changes. And because of the ongoing low amplitude of solar cycle 24, polar atmospheric circulation is still undergoing its change phase. The equatorial rotation is speeding up and the polar rotation is undergoing its rotation changes at a different rate and affecting polar circulation patterns. With stronger rotation at the equator perhaps driving stronger atmospheric uplifting of winds. Or maybe not. But LOD in an extended solar cycle minimum period will be different. Weaker interplanetary magnetic field, weaker flares and CMEs, slower avg solar wind speed means less resistance to Earth in the course of its orbit about the sun and Earth rotates faster, with less resistance..
ENA O H He Ne C and dust in the Interstellar wind.. ACR, GCR and Solar CR. The Van Allen Belts should be fun in the ongoing debate on climate change. When I saw the headline I was instantly trying to figure out on WHAT grounds the evidence for the sun effecting climate as being minor was to be eliminated? I mean “how” did they do this trick? I was GOB smacked to learn their LACK of relationship to the sun is based NOT on the sun’s actual output and climate but a computer model. Folks, exactly how stupid can we get? No wonder there no links to the original paper with data. several more I failed to list. The really funny part is the government is already using the above information to explain and manage why fishery stocks change. In other words the above information is already being put to good practical use. This study is not the first nor the last in a long line studies that shows correlation between temperature changes and changes in the suns output. Changes in the suns output are very important in this data. This sounds like one of those “hide the decline” kind of papers – something that not based on much if anything at all.